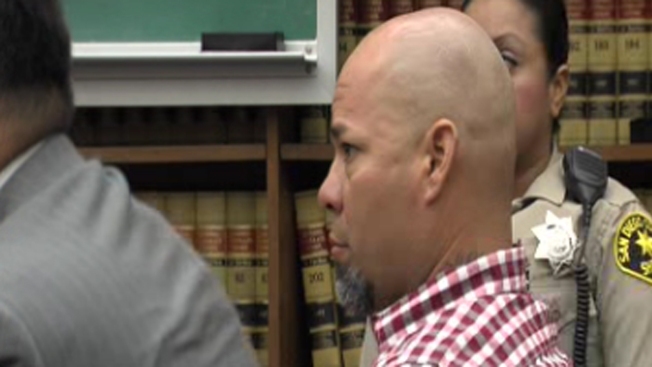 Angelo Fabiani Arroyo appears in court for his preliminary hearing on September 17, 2013. The mother of a 4-year-old boy who was fatally injured in a crash and abandoned at the site of the wreckage while in the care of his father took the stand in a preliminary hearing Tuesday. On the night of Sunday, Jun. 2, Nancy Snyder said she rushed to the hospital to be with her young son, Valentino, after learning he had been gravely injured in a car accident involving her ex-boyfriend. When she saw the critically injured boy at the hospital, she was completely shocked. “I saw the state of my son, and I was in disbelief over what had happened,” she recalled on the stand. Snyder said she knew nothing of the accident until that very moment. That weekend, she said her son had been in the custody of his father, Angelo Fabiani Arroyo, 40, who is accused of crashing his pickup truck and leaving the critically injured boy behind at scene of the wreckage. On the night of Jun. 2 officials say Arroyo crashed his truck off Interstate 5 near Old Town San Diego and the Midway area, rolling the vehicle off the roadway. Arroyo’s vehicle wound up landing on its side on an embankment along Jefferson Street. Upon impact, little Valentino was partially ejected from his car seat and the truck. Witnesses at the time told NBC 7 San Diego they could see they boy hanging out of the window of the wreckage. According to California Highway Patrol officials, Arroyo took off running immediately after the crash, leaving Valentino behind. CHP officials say Arroyo returned to the scene a moment later to unbuckle the boy from his car seat, but then got scared and took off running again. Unstrapped, Valentino fell on his back and hit the concrete curb, falling approximately 10 feet from the truck to the ground, CHP Officer Juan Escobar said at the time of the crash. Good Samaritans tended to the boy at the scene and pulled him away from wreck. He was taken to Rady Children’s Hospital, but was badly injured and died at the hospital about a week later. Arroyo was arrested two days later – on Jun. 4 – in Imperial Beach and charged with a hit and run and child endangerment. The father was arraigned on Jun. 6 and pleaded not guilty to both charges. During his emotionally-charged court appearance back in June, Arroyo’s loved ones defended him, saying he panicked following the crash and was possibly disoriented. A prosecutor revealed Arroyo was on probation at the time of the collision in connection with a DUI case from two years ago. At Tuesday’s preliminary hearing, Snyder – who, in the past, had dated Arroyo and lived with him – said she and Arroyo shared custody of Valentino. She took care of the boy during the week, while Arroyo typically had custody on the weekends. On the weekend of the crash, Snyder said Arroyo was supposed to bring Valentino home to her on Sunday evening after they had spent the day at Mission Bay. Snyder said she texted back and forth with Arroyo around 4 p.m. At that point, he told her he'd have Valentino home soon. However, as the hours passed, Valentino never came home and Snyder said Arroyo failed to call or text her. Later that night, Snyder said she received a phone call from her brother and authorities, who explained that her son had been critically injured in a crash. Snyder said she immediately rushed to the hospital, where she continuously stayed by Valentino’s side until the boy’s death on Jun. 10. Snyder said she didn’t hear from Arroyo the day after the crash either. By Tuesday, Jun. 4, officials told her they had arrested Arroyo in Imperial Beach in connection with the hit and run crash. If convicted, Arroyo faces seven years in prison. Meanwhile, Valentino would’ve turned 5 years old next month. On the stand, his mother said the boy was born on October 20, 2008.